Social Media has turned into a full time job, but not many libraries can devote many resources to it. How to stay relevant online despite trying to do everything else that needs to be done for the library? 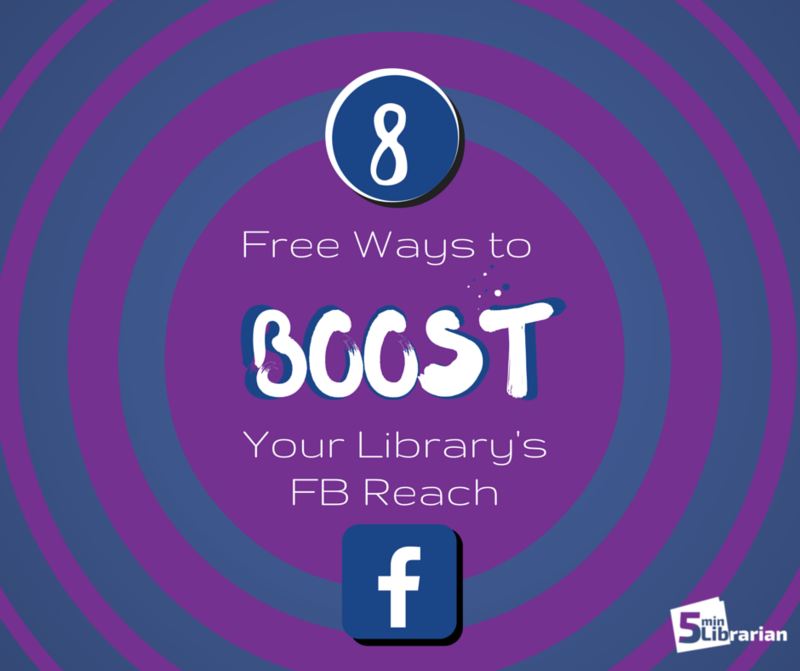 Here are eight tips to help boost your Facebook reach that do not cost any money! We started a Facebook Group called The Shareable Clique for librarians. Over 400 members share their posts that have gone viral. It is a great way to see what works with patrons, to recreate the great ideas and to reshare quality content/images that has done well. Come join us! Facebook did not make it easy to schedule shares, but Susan from Oh My! Creative found a way around that. You click on the image to get a special URL that you can then use to schedule on your own page. 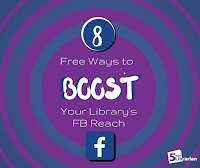 As we discussed in a previous blog post, 10 Facebook Tips Patrons Wish Their Libraries Knew, you should be posting two times a day, seven days a week for maximum reach. One should be serious and one should be fun since people are on Facebook for work and play. Sharing viral posts from other pages is a great way to reach that fun quota, AND Facebook will give you kudo points, showing your content to more fans because it is proven to be quality content. But it is hard to do this daily, so it helps to schedule shares ahead of time. One of Facebook's great underused features is the ability to put pages into lists, essentially curating specific newsfeeds that will show you ALL posts from the places you want to see. This is perfect for finding great content to respost and it doesn't clog up your current newsfeed. Put all of your favorite pages with quality content and images into a list and then visit that list when you're looking for great things to reshare onto your own account. To get you started, I created my own Viral Content for Libraries List that you can subscribe to and copy. Google Alerts allows you to set up notifications so that when a specific word is mentioned online, you'll get an email (which can be instant, or in a daily or weekly digest). Make alerts for your community and books so you will have fresh content to share, outside of your library. As we discussed before, the social media standard is to post 1/3 your content and 2/3rds outside content -- but the trick is, that outside content has to be something that interests your patrons. Low reach, it'll hurt your next post's reach. Same for Facebook Notifications. Any page that you follow, you can click on the down arrow next to "liked" and mark it for notifications. I do these for our city and schools since they do not post often on social media, so I always miss the announcements. Anything relevant and viral, I reshare on our page. There is a website called If This Then That (IFTTT) which puts the internet for work for you. It will connect accounts together so, for example, if you publish a blog post on your website, it will automatically be posted on Facebook and Twitter. It is really handy for the busy librarian! Facebook is revamping how they do events and I'm super excited with the changes! Events will be treated differently than posts. More will be showing up in the newsfeed as well as event recommendations. And you can now send invites to nonFacebook users, which increases your reach without having to do more work. 7. Get Facebook Event Subscribers! Facebook now allows people to subscribe to your events. I wouldn't post 100% of your events online, but the major ones that people would be disappointed to miss would be good. All subscribers will get notifications of your events and all you need to do is upload them. You can also share your list of events (perfect for Summer Reading programs) with a click of the button when you're on your event page. You can now embed a Facebook post which is perfect for libraries with online newsletters and blogs. Including Facebook posts outside of Facebook will allow you to get more mileage with your posts, catching those who might have missed it or nonFacebook users who click on the link to check it out. If they click on it, it'll help your reach!